McAllen - Ercilia Falcon, 93, went to be with our Lord on April 21, 2018 surrounded by her loving family. Ercilia was born March 15, 1925 in Guardados de Arriba, Tamaulipas, Mexico to Gertrudes and Francisca Guerra. She is preceded in death by her husband Raul Falcon. 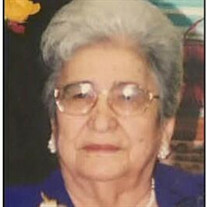 Left to cherish her memory are her two children: Dr. Maria Elena (Antonio Villeda) Falcon and Juan Raul (Lucy) Falcon; two brothers: Gertrudes Guerra and Guillermo Guerra; one sister: Minerva Solis; two grandchildren: Elysa Maria Falcon and Roberto Carlos Falcon; two step-grandchildren: Antonio Gabriel Villeda and Sarah Villeda; as well as numerous loving family and friends. Serving as pallbearers will be Antonio Gabriel Villeda, Americo Gonzalez, Jr., Oscar Falcon, Jr., Alonzo Cantu, Mario Guerra, Guillermo Guerra, Jr. Honorary pallbearers will be Guillermo Guerra, Gertrudes Guerra, Horacio Requenez, Antionio Villeda and Carlos Falcon. Special thanks to Dr. Rodrigo Lema and Dr. Alvaro Giraldo; and to Sara Ortiz and Juanita Ibarra for their compassionate care.